When funeral season finally rolls around, you better be ready to bury and mourn all those new dead bodies. Here are six things you can do to get ready for the most wonderful time of the year! 1. Practice throwing fresh dirt on your sickliest relative: Looking to get ready for funeral season in a hurry? Start by placing a very sick relative at the center of an open field and throwing as much dirt at them as you can muster. Sure, it’s no graveyard, but when you have to bury them 10 feet under in the middle of high season, you’ll be glad you did. 2. Strengthen your upper body by carrying a coffin containing a loved one up and down the Pacific Crest Trail: When it comes to funeral season, merely being able to hoist a coffin above your head isn’t going to cut it. You’re going to have to carry that coffin thousands of miles using nothing but your bare hands, so run it along the West Coast a few times to get the kinks out now! 3. Frown for at least 30 minutes a day: Even just a simple half hour of frowning every day will have you in prime shape to look very sad by the time the first funeral rolls around. It’s a simple, easy way to practice mourning so you can start the season off right! 4. 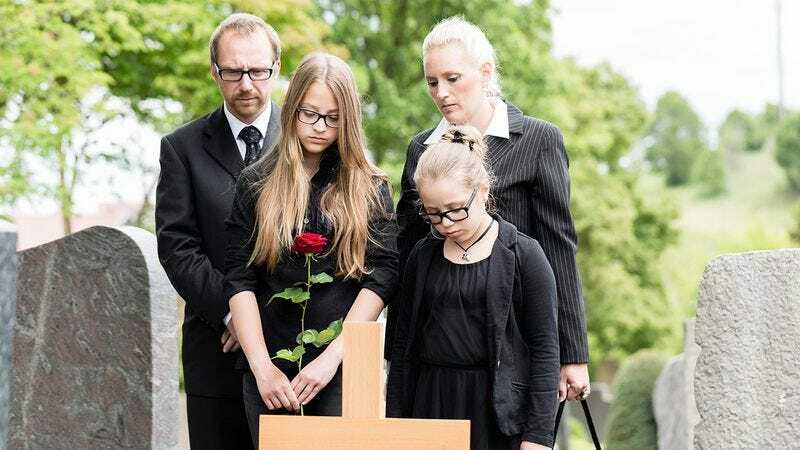 Brush all the burrs off your funeral tuxedo: Did you spend all of last funeral season picking burrs off your tuxedo while you drove from graveyard to graveyard? Don’t make the same mistake twice: get those burrs off now. You won’t regret it. 6. Signing up for FuneralDates.com: Just do it already! No one wants to spend funeral season alone.